One of the seven modes of judgment or of punishment man undergoes after death, as described in the treatise "Ḥibbuṭ ha-Ḳeber," also known as "Midrash R. Yiẓḥaḳ b. Parnak." According to a description given by R. Eliezer (1st cent.) to his disciples, the Angel of Death places himself upon the grave of a person after burial and strikes him upon the hand, asking him his name; if he can not tell his name the angel brings back the soul to the body, to be submitted to judgment. For three successive days the Angel of Death, with a chain made half of iron and half of fire, smites off all the members of the body, while his host of messengers replace them in order that the dead may receive more strokes. All parts of the body, especially the eyes, ears, lips, and tongue, receive thus their punishment for the sins they have committed. Greater even than the punishment in hell, says R. Meïr in the name of R. Eliezer, is the punishment of the grave, and neither age nor piety saves man from it; only the doing of benevolent works, the showing of hospitality, the recital of prayer in true devotion, and the acceptance of rebuke in modesty and good-will are a safeguard against it. 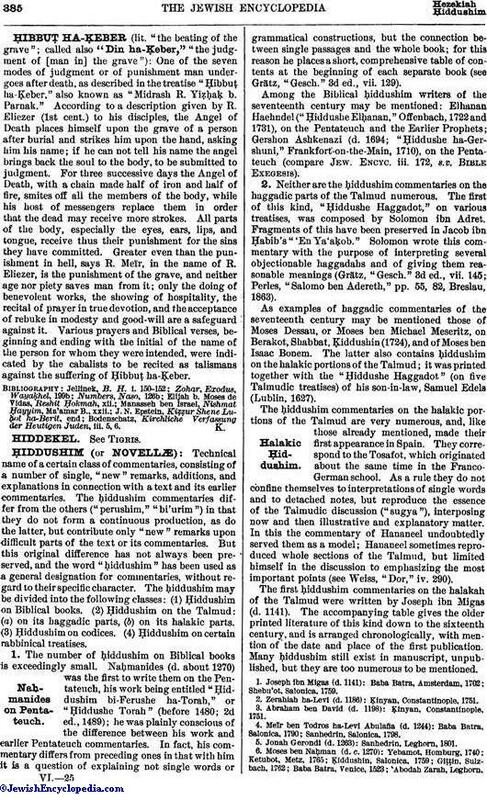 Various prayers and Biblical verses, beginning and ending with the initial of the name of the person for whom they were intended, were indicated by the cabalists to be recited as talismans against the suffering of Ḥibbuṭ ha-Ḳeber. Bodenschatz, Kirchliche Verfassung der Heutigen Juden, iii. 5, 6.